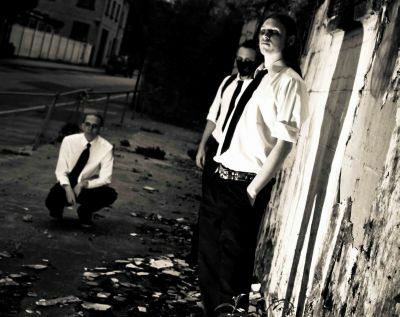 For our latest band spotlight, we go back to our roots and talk to one of the most exciting pure industrial acts to come out of the UK in recent years. Niall Robertson (programming, vocals and production), Ste Houghton (programming and vocals) and Adam “Hig” Higginson (programming, synth and guitars) of Lancaster’s Cyferdyne (formerly Cyberdyne) talk us through their ideas, inspirations, the state of industrial music and err… the challenges faced when comparing eggs to doors. S] How did Cyferdyne form? S] Talk to us about your musical backgrounds? S] What would you say the highlight of Cyferdyne’s career has been? S] How are the inspirations and goals different with Cyferdyne to what they have been in other bands that you’ve taken part in? S] Are you inspired and motivated by the music that you make? S] You’re based in Lancaster, talk to us about the music scene there? S] Have any of you ever given thought to acting as a producer for new talent in the area, as a way of helping to promote it? S] What is your opinion on modern industrial music? S] Talk us through your writing process – do you have a favourite place to write for example, or, is it very studio-based? S] Take us through the song ‘Afraid To Dream’ for example, what went into that? S] What are the band’s plans for 2012? S] Is there anything else that you would like to add? For more information visit the official Cyferdyne Facebook page.